The beginning of the year is a common time to set goals, so I shared mine. Now that the year is one-fourth over, I'm going to take a look at my progress. Since I set this goal I have learned that tuition is due a month earlier than what I thought. Also, we've had some unexpected medical expenses. So, we've been pulling money out of the Lending Club account as notes are paid. Also, we are reducing our exposure to Kickfurther for a lot of reasons, and instead of reinvesting that money elsewhere, it is going toward tuition. Once I pay this year's tuition, I'm going to open a separate savings account and deposit money monthly so that next year it is there when the bill comes. Luckily this is a "fix it and forget it" goal. The money comes out without us thinking about it. I've done one sponsored post this year and was paid for it. I added Myfinance ads to the blog, but so far I haven't seen any return. I'll give them another few weeks and if I don't see any return, they'll be gone. This goal got pushed to the side due to tuition. One of my regular customers has decided to put her blog on hiatus for now. She says she may contact me later. I've applied for a couple of jobs on Upwork but without success. Most of what I see there doesn't interest me--too much work for too little money. Hopefully my college girl will get a job before the end of the year and start paying rent (or at least her own car insurance). Otherwise, this isn't looking good, unless you count the transfer of money from a non-IRA savings account to an IRA account to reduce our tax bite. I need more cooperation from the peanut gallery on this one! I've got to get in touch with the IRS and try to track down my Dad's final tax refund. They should have paid me already and then I could distribute the rest of the money in the estate and start working on the house. We are going to paint this year. My firm has decided to change the sick leave/vacation policy so that those of us who have a bunch of leave saved up have to use it over the next two years. I'm getting five weeks off this year and will spend at least on of them with a paintbrush in hand. 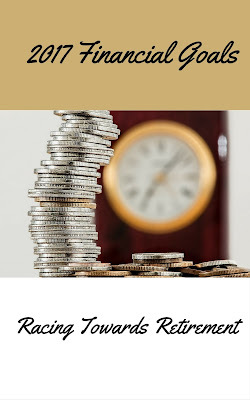 When you think of retirees you think of people who have time to engage in hobbies. For many people it is also a time when money can get tight. What if there was a way to get items to use, sell or give as gifts, and all it took was a few minutes of your time? Many of my "Kickfurther Merchant of the Week" posts include a giveaway--and there is a reason for that. Giveaways attract readers, which makes both me and the company about which I am writing happy. Like most online giveaways, mine ask entrants to visit the sponsor's webpage and/or facebook page, to follow me and the sponsor on social media and to spread the word about the giveaway. 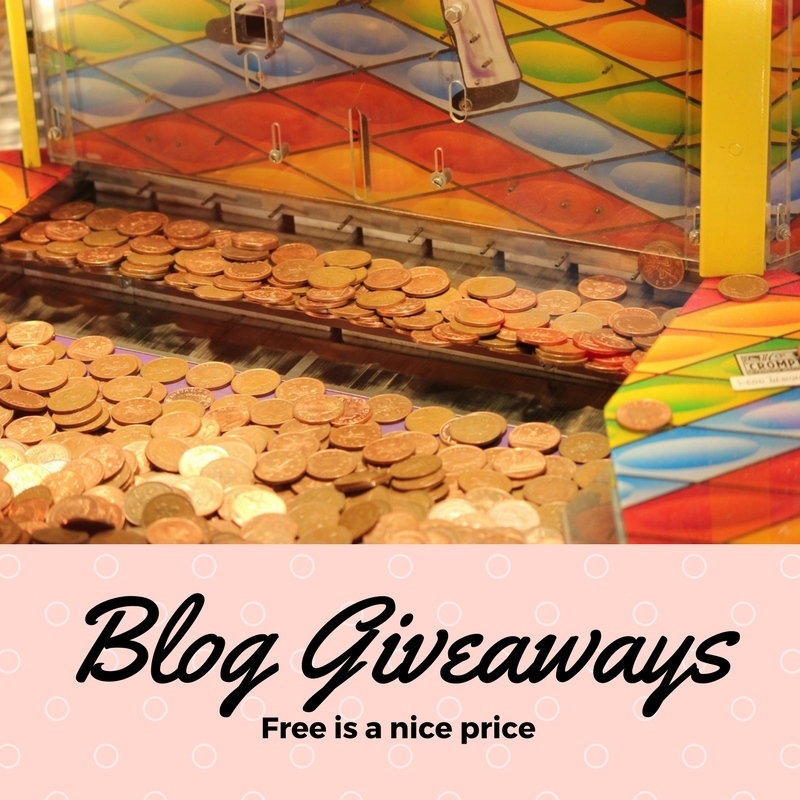 It's great if a blog you follow regularly is offering a giveaway, but how can you find the really GOOD giveaways? Well, first of all, you have to define "good". Some people are looking for high-value prizes, but the reality is that giveaways of high-value prizes attract hundreds if not thousands of entries and generally allow multiple entries per person. In short, while the value of the prize may be high, the chances of winning are low. On the other hand, there are plenty of giveaways in the $10-$30 range that take only a few minutes to enter and which attract few enough entrants to give everyone, particularly those who are willing to take time to earn all the entries, a decent shot at winning. Link-ups are a popular way to publicize giveaways. Below are some link-ups that accept links from any giveaway. They help bloggers get more entrants for their giveaways and help readers find more contests to enter. If you only want to enter contests you have reasonable odds of winning, check out these link-ups. They only allow contests that have fewer entries than their rules allow, and some only allow contests ending within a week. I just decided I wanted to win an I-Pad. I Googled "I-pad giveaway" and sure enough, I found some. You are using a feed reader to follow your favorite blogs, aren't you? My favorites are Bloglovin and Feedly, but there are others out there. Feed readers allow you to subscribe to your favorite blog and then view the title and first few lines of posts on the reader app or website. If you find a blog that offers a giveaway that interests you, subscribe to it. Feed readers allow you to skim through a lot of blogs in a little time, and when those giveaways hit, you can follow the link to enter. Many online contests use either Rafflecopter or Giveaway Tools. Both offer bloggers either free or paid versions, and of course you are able to do more with the paid versions. However, on either one, a blogger creates a contest and selects one or more entry methods from the offered choices. There are a lot of high-dollar contests what start on one blog, but invite other bloggers to participate, either for free or for a fee. This can result in giveaways where you can earn dozens of entries by following various bloggers on various forms of social media, by commenting on various blogs and completing other assigned tasks. On the other hand, some bloggers simply ask you to leave a comment on their blog in order to enter. I don't spend a huge amount of time entering blog giveaways because the blogs I frequent don't offer them frequently and I don't have the time to spend a lot of time looking for giveaways. However, I have won several book giveaways over the years. While most were for individual books, my biggest win to date got me a huge haul. I have won holiday decor and snack samples as well. Unfortunately, I have not won an I-Pad, yet. Which Ones Should I Enter? It depends. If you see a prize you'd love to have, enter. If you see a prize that you know you could sell for substantial money, or that you know a loved one would enjoy, then enter. However, the more valuable the prize, the longer entering is likely to take and the lower your chances of winning. I have had my best luck with niche prizes (like a boatload of Catholic reading material) or simple inexpensive prizes simply because few people enter those contests. Many people who enter a lot of contests have email and social media accounts just for that purpose. If you have a Twitter following that cares about financial planning you may not want to innundate them with "enter this contest" tweets, but tweeting is a common way to earn entries in most giveaways. You may like to keep your Pinterest feed very curated, but many contests ask you to pin things or follow people. If you have accounts solely for giveaways, you don't have to worry about losing hard-earned followers because they don't want to follow contests. Entering blog contests can be time-consuming but it isn't rocket science. It is something you can do while watching TV or for a few minutes here and there as you surf the web. Who knows, you could end up winning something really great, and you can't win if you don't enter. Leave a comment and let us know if you've won any giveaways! One big promise of Donald Trump and the Republican Party was to repeal the ACA a/k/a Obamacare. Recently the Republicans introduced their "ACA" or American Care Act. Don't charge me more than I can comfortably afford--I guess no more than cable TV or Netflix costs me each month. Cover me at 100% for any condition that remotely resembles sickness or lack of health or relating to the body or mind in any way. Cover me whether or not I choose to buy insurance before this ailment struck. Make sure I can see any doctor at any time and get any tests or treatments (proven or unproven) that I or my provider of choice (M.D., Chiropractor, Naturalpath, Homopath, Witchdoctor, Esthetician or Mother-in-law) think I need. it sounds so reasonable, so right, so much like what we as a county ought to be able to do for our people. We spend a lot of time complaining about the cost of health insurance, when the real problem isn't the cost of health insurance, it is the cost of healthcare. The average per-capita cost of healthcare in the US today is over $9,000. Under the ACA, plans have to pay out 85% of what they collect in premiums or they have to refund the premiums. While eliminating insurance companies may reduce that 15% figure somewhat, someone is still going to have to push the paper and the paperpushers, whether employed by an insurance company or by the government, will have to be paid. According to the webiste above, the average cost of a family insurance plan through an employer in 2016 was $18,142.00. I daresay few employees pay close to that; employers pay a major portion. If you assume 15% of that was insurance company overhead, you are still looking at costs of over $15,000 per year, and you know that people are still going to have co-pays and deductibles. While the ACA subsidizes insurance for people whose income is below a certain point, the fact that plans have to cover so much, accept anyone and not charge sick people more, or old people too much more, makes them very expensive for those who do not have subsidies. My family makes too much for a subsidy. We have 2 people between 40 and 65, one between 20 and 39 and one under eighteen. Using the figures above, our average medical costs per year should be $23,256.00. A search of Healthcare.gov showed that average Bronze plan offered there would cost $25,000 and the lowest priced one, $18,000--and we'd still have to pay most of our medical bills. While there are a lot of people out there who make less than we do, neither my husband nor I are high earners. Those policies would make a severe impact in our standard of living. Right now, because of employer subsidies, we are paying about half that for better coverage. Why Don't Other Countries Pay as Much? There are people whose back pain would resolve within that wait time and would no longer need the MRI. Of course, if you are in pain and trying to pursue treatment, that wait is thirty more days you will be in pain. I read somewhere that if you compared American couples who were referred to fertility specialists, with Canadians who were referred to fertility specialists, after six months twice as many Americans were pregnant. That sounds like American treatment is much better; however it doesn't mean that at all--the Canadian couples were still on the waiting list, so on average, half those American women who underwent (and paid a small fortune for) fertility treatment really just needed more time. On the plus side for the Canadians, once they cleared the waiting list, their treatment didn't cost them much, whereas most Americans sustained substantial costs for infertility treatment until coverage was mandated. Many countries set the rates of reimbursement (payment) to doctors and hospitals and for medications. They consider price when deciding whether particular treatments will be available. That's one reason you will find a wider variety of drugs and treatments available in the US than in many countries--here a drug can be offered for sale if it is proven safe and effective--and for some drugs, "effective" can mean they add months to life of the average cancer patient. The negotiating power of one government is stronger than the power multiple insurance companies, which is why it is less expensive to buy drugs in Canada than in the US. England's National Health Service requires referral by a primary care physician in order to access specialist care and the NHS has waiting lists and a reputation for being an impersonal bureaucracy. England's system is two-tiered; everyone is entitled to use the NHS system and those who can afford to do so have access to a private system as well. What Should Health Insurance Do? One big problem I see with any healthcare solution is that different people have different needs. I'm a middle-income person who is not living paycheck to paycheck and teetering on the edge. Reality is that much as I may dislike it, I can afford a $150 doctor's visit. Reality also is that there are a lot of people out there who can't--that $150 will throw a major crimp into their lives, make them late on other bills and so forth. I need my health insurance to protect me from the major problems, not the day to day normal expenses of life. Someone living on the edge may choose to forgo necessary treatment because of lack of financial resources; they need a healthcare plan that allows them to see a doctor when needed without worrying about it throwing them into financial ruin. On the other hand, I've worked a lot of Medicaid fraud cases that couldn't have happened (or would have been a lot less likely) if the "patients" had to pay something out-of-pocket for care. All of us are more careful about spending our money than spending the insurance company's money or the governement's money. How do we balance meeting people's needs without encouraging waste? My problem with both the Affordable Care Act and the American Care Act is that they don't address the real problem in any real way. The real problem isn't the cost of insurance, it is the cost of healthcare. The Affordable Care Act was clearly an act of cost shifting. The employer mandate shifted costs from the employee to the employer, if the employer wasn't already providing insurance. If shifted costs from the individual to the taxpayer if the individual's income was below a certain point. It shifted costs from the sick to the healthy and from the old to the young. The sad economic reality is that there are two ways to control costs. The first is to reduce demand, the second is by government containment. The law of supply and demand says that if the supply of something outstrips the demand, the price goes down. If the price of something is too high, the demand for it goes down--even if people want it. The cost of houses in my neighborhood fell a few years ago. Why? It wasn't because fewer people wanted houses this size. It wasn't because it cost less to build. It wasn't because the neighborhood went down. The price of houses in my neighborhood fell because the cost of insuring them increased substantially. People's housing budget is limited and the increased cost of insurance meant that fewer people qualified for a mortgage in the amount needed to purchase at what was the going price. Some people who had stretched to buy when the market was at its highest found themselves strapped to pay both the mortgage and the insurance and had to sell or face foreclosure. Contrast that with healthcare. The largest purchaser of healthcare in America today is one that will never run out of money--the government, via Medicare, Medicaid, the VA and Tricare. While people may choose to forgo small routine medical expenses due to cost, health insurance paid for by someone else pays so many of our expenses that for most middle-income Americans, "I can't afford it" isn't part of the discussion with the doctor. Lack of purchasers is not going to push the price of healthcare down unless we radically change the manner in which we pay for healthcare AND are willing to see our friends, neighbors, family members and even ourselves do without needed or wanted medical care due to price. Other countries use the authority of the government to rein in prices. The government either directly negotiates rates with providers or it sets a global budget and when the money for the quarter or year is gone, it is gone. This government interference in the market can limit supply, but it keeps the price of the supply lower. Generally speaking governments that control the price of healthcare also assure that all citizens have access to it, something our government does not do. In my opinon one reason we have runaway costs is that we are unwilling to use either system to control costs. We have such safety net and so much money spent on the middle and upper class that the demand for healthcare is not moderated by price. I suspect that if you passed a law tomorrow outlawing health insurance that had less than a $20,000/year deductible, the price of healthcare would drop because people would start looking for less expensive doctors, choosing less expensive medications etc. We aren't willing to do that because many people would be hurt and forced to choose between medication and food. We are also unwilling to give the government the power to control prices charged by private businesses. Because of the high prices we are willing to pay, we have higher survival rates when serious illness strikes. 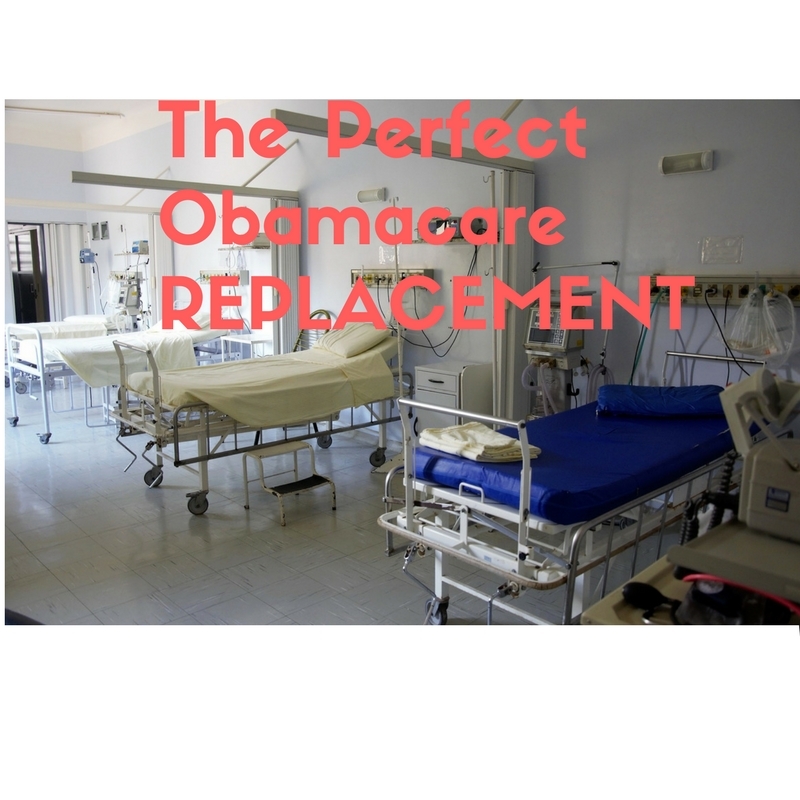 So What IS the Perfect Replacement for Obamacare? Sorry, I'm not smart enough to know the answer to that question, and frankly neither is Donald Trump. Obamacare has its problems and as a conservative, I have problems with the cost shifting and the way it has hastened our country's move to one with well-paying middle class jobs that provide health insurance and low paying unskilled jobs that not only do not provide health insurance but also do not provide fulltime hours, specifically to avoid having to pay almost as much in health insurance premiums as in wages. As a Catholic I don't like the way Obamacare has mandated that employers purchase contraceptive coverage even if they believe it is immoral. One idea I have is to eliminate employer-sponsored health insurance. Why should the managing partners of my firm get to pick my health insurance? I'm smart enough to do that on my own. Give me the money and let me do it--and make the premiums non-taxable, just as they are when purchasing through the employer. I like the idea of a payroll tax on both employers and employees, for both fulltime and part time employees, coupled with tax credits for the purchase of health insurance or paying healthcare bills. What we have isn't working for more people every year. Obamacare helped more people get insurance, but it hasn't been around long enough to say whether it allowed more people to access healthcare and it certainly hasn't done anything to bring costs down. 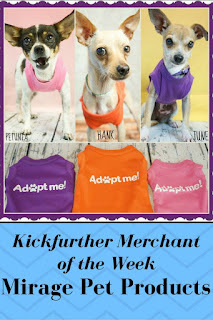 This week's Kickfurther Merchant of the Week is Mirage Pet Products. For those of you who aren't familiar with Kickfuther, it is an online investment platform through which ordinary people can help businesses finance inventory purchases. Instead of lending money to businesses, the Kickfurther model is a "consignment sales agreement". Basically, investors pre-purchase the inventory and then give it back to the business to sell on consignment. As the inventory sells, investors are repaid, with a profit. Mirage Pet Products is one of those businesses. Q: Tell us a little bit about Mirage Pet Products. Where is the company based? Q: When was it founded? Your website mentions a legacy of six generations in the pet industry. Tell us about that. A: My great, great grandmother was a dog groomer back in the heyday of the Standard Poodle and fancy cuts. My grandfather worked in a belt factory that transitioned into a dog collar factory over the years. He bought it in El Monte, California, and moved it out to Missouri. My great-grandmother worked in the factory, helping her son and daughter-in-law for decades before retiring. In 2004, with my husband fresh off of active duty from Operation Iraqi Freedom, we started Mirage. We were 19 years old and just knew that working for ourselves was what we wanted to do. We were inexperienced and crazy but here we are still today! We had a lot of mentoring and help from my grandparents and great uncle. After so many years in the industry, they were able to guide us through quite a few changes in the economy (including the 2008 recession) and changes in demand. I will always cherish their assistance. Q: It is wonderful to have family support behind you, and thank your husband for his service. Your website says that most of your products are manufactured in the US. Where are they made? Do you have your own manufacturing facility or do you buy from manufacturers? A: Most of our products are made here in Aurora, MO. We have a tight knit production crew working for us, they are amazing. Q: I'll be the first to admit I'm not a pet person and that I don't keep up with the latest in pet fashions or needs. However, I have noticed more and more pets wearing clothes, particularly in the winter. Are clothes for the pet or for the owner? Q: I notice you have a lot of Mardi Gras wear for dogs. I live in the New Orleans area and wish to compliment you on your good taste. Do you sell much of that line to people outside the New Orleans/Louisiana/Gulf Coast area? A: We do! Mardi Gras is becoming a larger holiday nationally and we are definitely seeing this trend reflected in our sales! Q: Do sell wholesale, retail, or both from your website? Q: Your dog treats are adorable! If I want custom colors or designs to match my party, are they available? A: Absolutely! We can custom make treats with anything on them! Q: How did you learn about Kickfurther and why did you decide to use them? A: I don't remember who it was but one of the KickFurther staffers sent us an email invitation and we decided to sign on! I'm so glad that we did, it's been a great experience! Q: As an investor, I'm glad you feel that way. You finished your first Kickfurther offer ahead of schedule, and your second a little behind schedule. What was the difference? A: The second one included us pre-selling merchandise and offering customers long-term credit which really did not work in our favor over the slower summer months. Q: From your perspective, how does Kickfurther compare to other sources of financing. Put another way, you are now on your third offer; why do you keep coming back? A: We love the community! Q: To what type of business would you recommend Kickfurther? A: Because KickFurther has made some disappointing changes to their platform (at this point we won't be back for a fourth round) we won't be recommending KickFurther going forward. We used to recommend it to every business owner we talked with about funding/financing issues. Q: You must mean Kickfurther's decision to only finance businesses that have purchase orders for their products. I can see how that could be disappointing to a company that fulfilled its promises on prior consignment sales agreements. However, enough businesses were not meeting their obligations such that many if not most investors have lost money at this point. I know I have. From the message they sent investors, I think they will re-open the platform to businesses like yours once they re-tool some of their contracts and vetting procedures. Have you tried Kickfurther from the investor side? Would you recommend that friends or family invest via Kickfurther? A: I would've before the changes! I haven't had a chance to use it from the other side. Q: Do you have a giveaway for us? A: Yes! We've got two gift certificates for $25 each. Q: Thanks. I'm sure two of my readers will enjoy them! They can buy something cute like a sparkly dress and a new seasonal collar. Anything else you'd like to tell us? A: Thank you to those who have invested in us, it's been a pleasure to work with you!! It has been a pleasure getting to know you! Mirage Pet Products can be found on Amazon or on their website. You can follow them on facebook or on Pinterest. Now, on to the giveaway!